Every year we hear about how many people make a New Year’s resolution to lose weight and get fit. Just as I’m writing these opening sentences, two separate commercials have appeared on TV about weight loss programs. Yet, every year we hear about how many people don’t keep their resolutions. Despite the odds against us, human nature prevails and we keep up the tradition of resolutions, many with good intentions such as losing weight and exercising more. And even if a small fraction of people stick with a resolution, it’s certainly not a bad thing that a few more people have found their way to a healthier lifestyle. With that in mind, I thought it would be fun and a source of encouragement to provide some ways residents and visitors in Madison can stay committed to a New Year’s resolution to get healthy and exercise more. My suggestions focus mostly on these darker and colder days of winter when the resolve to stay fit can sometimes be a challenge. Cross country skiing. Madison has a number of groomed trails at golf courses like Odana Hills and Yahara Hills. One of my personal favorites is Glenway Golf Course. This nine-hole course is tucked away in a near-westside neighborhood between a cemetery and the Southwest Bike Path. As you ski toward the back of the course, it’s very secluded with many beautiful old trees. Since it’s not groomed, be sure to be respectful of the golf course and only ski when conditions permit. Beyond the golf courses, I’d also recommend Pheasant Branch Conservancy in Middleton, another beautiful and secluded area in the midst of our city. If you need skis, rentals are available at Odana Hills or at our local sporting goods store, Fontana Sports. Snowshoeing on the lakes. While this winter has been abnormal where ice hasn’t formed, Madison lakes are often a great option for snowshoeing. Similar to going out on a lake in the summer, the views of the city are stunning, and a day or evening snowshoeing in the winter is a very peaceful experience as well. Guests at The Livingston Inn can enjoy a fun snowshoeing excursion from our lake access across to the UW campus and the union. If you need snowshoes during a visit, Fontana Sports is again a great option. Join a health club. Similar to those weight loss commercials, health clubs heavily solicit new members this time of year. So why not take advantage of some of the special offers and make it the year join a health club? Madison has so many options from the nationwide chains to large and small local clubs. Close to The Livingston Inn are two great local options: Capital Fitness and Pinnacle Health and Fitness. If you’re a guest here and have joined a health club at home, remember The Livingston Inn offers free health club access to Pinnacle Health so you can maintain your workout schedule during your visit. Schedule yourself on a walking tour or two. When the weather doesn’t cooperate with winter sports, like skiing and snowshoeing, running and walking are good alternatives. Walking is a great exercise, and if you’d like it to be more interesting, add in something like an architectural walking tour. While the Madison Trust for Historic Preservation has guided tours in warmer weather, the City of Madison has a very nice list of tours you can do on your own like the Old Market Place, Tenney-Lapham, and Mansion Hill tours in our neighborhood. Exercise your brain. A New Year’s resolution to get healthy should include body AND mind. No matter what your age, the benefits of exercising your brain, or intellect, go far for a long and healthy life. 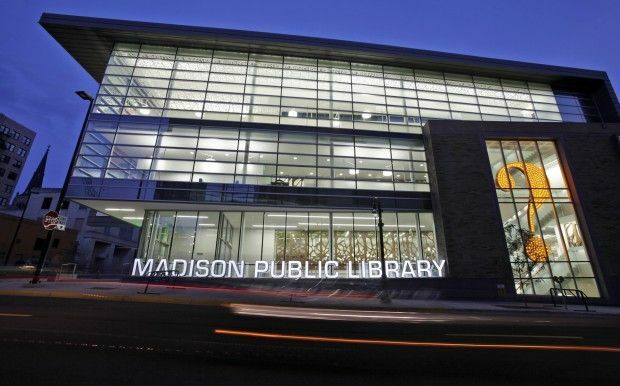 With that in mind, I would recommend regular trips to the Madison Public Library. Our downtown library was re-modeled just a few years ago, and it is such a fun place to visit. Just from its exterior, the building draws you in and makes it very inviting to spend an afternoon reading books and periodicals, perhaps bringing something home until your next library visit. If you’re staying at our B&B and want to incorporate a little physical exercise, the downtown library is an enjoyable 20-minute walk from our inn. Eat and drink well, locally. Madison features several companies dedicated to nutritious food as part of a commitment to health and well-being. One of my favorites is nut butter offered by the local company, Yumbutter. Yumbutter’s nut butters are an organic superfood made from nuts and seeds offering an ideal source for proteins and antioxidants. Available in peanut, almond, and sunflower, they all taste great, too. If you’re looking for something healthy to drink, many Madison residents have discovered the benefits of kombucha. Kombucha is a fermented tea drink made with living cultures of bacteria and yeast. While that may not sound appealing at first, kombucha has a very nice flavor similar to iced teas. The drink’s history stretches back to East Asian cultures where it’s believed to cure many diseases and afflictions. Today, fans of kombucha drink it to improve digestion and provide antioxidants to the body. While science has yet to support these claims, I’ll take a bottle of kombucha over a soda or sugar-intense energy drink any day. Here in Madison, NessAlla has been a local producer of kombucha for years and knows what it’s doing to make an excellent, quality product. You can find it in most stores and several restaurants throughout Madison. If you’ve made a New Year’s resolution of some type related to your health, I want to be the first to say you can do it. Don’t let any naysayers tell you resolutions are meant to be broken. But if you need a little support, hopefully the list above will inspire you to discover fun, creative, and sustaining ways to make 2016 a great year for your health!